Needing a refill on my meds yesterday, I planned to be at the Wal-Mart pharmacy exactly when it opened so I could get in and out with having as little contact with germ-infected people as possible. I arrived exactly ten minutes after the pharmacy opened to see a long line of senior geriatrics who'd had the same idea. By the time it was my turn, the pharmacist explained that they had a girl away on vacation and that it would be the better part of an HOUR before my stuff would be ready (as an aside, all I needed were a few inhalers which require NO counting of pills, but whatevs). I hadn't planned on staying around that long, but decided that I'd use the time to head into the actual mall (that's connected to the Wal-Mart) and get some ideas for Marc's birthday present. What I didn't know is that the mall didn't open until TEN! So, having NOTHING to do but wander around the big-box store, I begrudgingly got a cart and began exploring. Well THANK GOODNESS I did that because if I didn't, I wouldn't have found the GREATEST thing EVER! I've had nail stickers from Sephora before and they're fun, but kind of expensive at $20 a pop (even though they're $15US and our dollar is worth more...*grumble, grumble*). I don't really peruse the Wal-Mart cosmetic section, but since I was being held against my will, I took a turn down the aisle and found a Sally Hanson display with over a dozen different patters that are WAY better than the options at Sephora. Sally's nail stickers are UNDER HALF THE PRICE!!! That's TWO for ONE, people! There were butterflies, sparkles, fishnet patterns, circles -- sooooooo many options. They're just as easy to put them on and with a swipe of topcoat, I suspect they'll have a similar life expectancy of just under a week. Amazing!!! 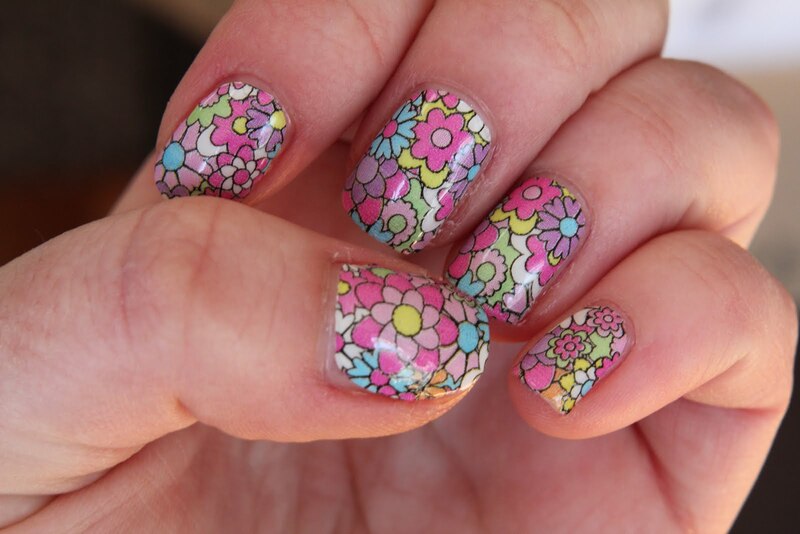 I'm obsessed with those nail stickers, too. FAB! Also, y'all have a mall CONNECTED TO Wal-Mart?! What the? I have never heard of or seen this, but how terribly convenient (well, except for the whole "opening at 10" thing). Cool! I tend to avoid Wal-Mart like the plague because I get so overwhelmed in there, but I may have to look into these stickers! andrea - oh YES, our Wal-Mart is connected to our biggest mall. PLUS, now I've heard that our Zellers is going to be converted into a TARGET. Best.News.Ever. TriGirl - They really ARE cool! I had to resist the temptation to buy all the available patterns.